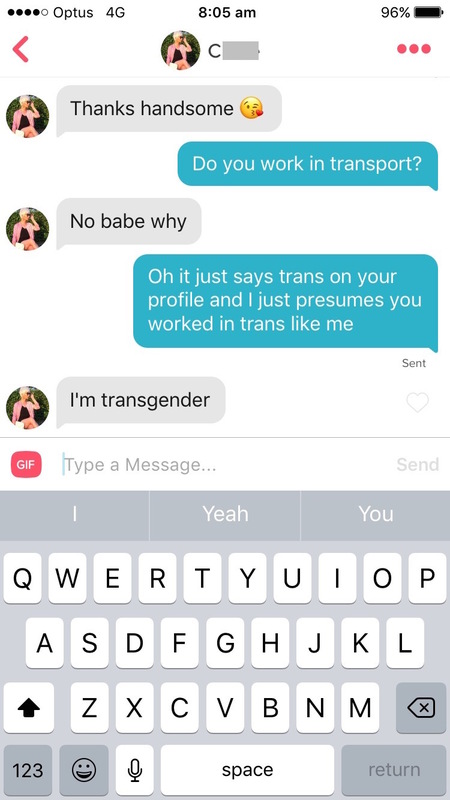 Things get awkward when Tinder doofus doesn't know what 'trans' means. Tinder provides endless entertainment in the form of dopey dudes being stupid. But today's example is especially cringeworthy. It was shared to Reddit by user T0mbi, who titled it: "So my mate unknowingly matched with a transgender girl today." Same prefix. Very different word. Some commenters were skeptical that this was real. T0mbi reassured them that his friend was not smart enough to pull off such a complicated hoax. Of course, the people of Reddit had plenty of questions, mostly about what happened next. T0mbi returned to the comments to explain. If you think this story is going to get less embarrassing, you're so wrong. When this happened, he sort of just stop kinda talking and his words started trailing off to nothing. I was driving and he was next to me and asked "Hey t0mbi, what's transgender?" Tinder: making ignorant thirsty people more aware of the world they live in since 2012.